I know I'm probably going to sound like a broken record but I have been so busy this month! Between projects and school, it's been really hard to find time to blog normally. With that being said, this month I had the AMAZING opportunity to write a guest post for Walnut Hollow (I can't believe I just wrote that)! I have been a fan of Walnut Hollow for the longest time and have always loved their products. If you're not familiar with Walnut Hollow, they are a company that sells wood surfaces, tools, and accessories for crafting. Their blog, Walnut Hollow Crafts, is always filled with crafty goodness and cute ideas. I had the opportunity to write a post for their fall entertainment series which was going on this month. My post for the series was a DIY Pumpkin Chalkboard Cake Plate (try to say that five times fast)! It combines two items from Walnut Hollow to create a cake plate that functions like a normal cake plate but can also be used to store extra utensils. 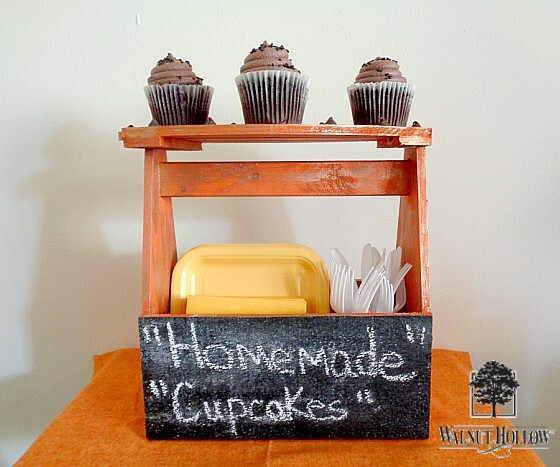 Besides the storage, you can also write on the front of the cake plate (which features chalkboard paint) to label your food! So if you want to learn how to make your own Pumpkin Chalkboard Cake Plate, then check out the full tutorial here!